The discussion the Affordable Health Care Act of 2008 (hereafter called the ACA) is no longer political. It’s the law now and the overturn movement has about the same likelihood of success as the O.J. Simpson appeals. I’ll also assume for the purposes of this missive that Romney won’t be elected in 2012. If by some stretch he is, then it will be a different conversation we can have then. 1. The creation of Medicare/Medicaid in 1965 via Lyndon Johnson. 2. The evolution of the Medical-Industrial Complex in the USA and where it’s headed. In 1965, although we didn’t appreciate the impact it would have at the time, those in my age group watched the President use his bully pulpit to establish health care indemnification for the “elderly” (over 65) and the “poor” (below an established poverty line). I recall my father the general surgeon howling in anguish at the thought of “Government Medicine”. He and the rest of them thought this was the first step on the road to inevitable perdition, but the reality was that it made my father’s generation of physicians rich and created the American Medical-Industrial Complex. It created the Complex by altering the supply and demand curve of health care financing into a situation where consumers of medical services bore no responsibility for the cost thereof. Cost of services was borne by third parties who had no idea if the services were needed or necessary. Providers could create demand for services and then create supply to meet it, all financed by third parties who paid for it on the basis of correct paperwork. Today, the government in the public sector, including such programs as “Medicare, Medicaid and the Veterans Health Administration, provides 60-65% of health “insurance” (such as it is). American health care is the most expensive in the world. The Congressional Budget Office reported that “about half of all growth in health care spending in the past several decades was associated with changes in medical care made possible by advances in (expensive) technology”. In 2009, the United States federal, state and local governments, corporations and individuals, together spent $2.5 trillion, $8,047 per person, on health care. This amount represented 17.3% of the GDP, up from 16.2% in 2008. The Health and Human Services Department expects that the health share of GDP will continue its historical upward trend, reaching 19.5% of GDP by 2017. Growth in spending is projected to average 6.7% annually over the period 2007 through 2017. But the United States ranks poorly in, among other things, preventable mortality, below Canada, Ireland and Portugal. The reality is that a government throttling a public that views health care as a right is political anathema. Their only option is to let the public have their fill and cut back at the level of providers. But all such attempts to control this spiral have failed. In the past, the government tried to control demand by limiting supply. Managed Care during the Clinton years generated little other than public anger. Rationing by provider inconvenience (endless convoluted paperwork) generated only the creation of expert professional paperwork managers. The current ploy of refusing to pay for “events that shouldn’t happen” (urinary tract infections, pneumonia) will be met by creatively re-defining these disorders. Hospitals routinely accept a relatively small percentage of reimbursement from negotiations with insurance companies. UPMC bills US$1480 for a bedside percutaneous tracheostomy and Medicare reimburses US$480. However, if the patient has no insurance, they are billed full freight (US$1480) and the facility is quick to turn the debt over to a collection agency. Accordingly, an unexpected medical emergency has the potential for ruining a family’s finances permanently. A 2007 study found that 62.1% of all personal bankruptcies involved high medical expenses. This issue cries out for justice, and the rest of us will be involved in it. In the new millennium, an escalating cost spiral feeding unlimited and unrestrained demand with the government and other indemnifiers cutting expenses at the provision level has the REAL potential to collapse the entire system. SOMETHING has to be done to address it. Standing around hoping it spontaneously improves is NOT an answer. 1, Increasing affordable health care for more American Citizens currently unprotected and at risk for financial disaster if they get sick. 2. Making health care indemnification portable, once you get it you can keep it. 3. Forcing insurance companies to stop “cherry picking” clients least likely to make claims, refusing to pay for services after they’ve been rendered and increasing their premiums ad lib while at the same time decreasing their covered services. 1. It has become less of a proprietary social issue and more of a political football. Political opponents use it as a wedge to lessen the influence of the particular political party. Any utility it may have for the general public is lost in the fight. 2. All insurance companies provide more or less cost effective service by managing risk. Clients with a history of drunk driving and lots of speeding tickets pay more for insurance, or are uninsurable. This is a fact of life. The ACA purports to provide “new” indemnification for an estimated thirty one million patients not currently insured without addressing their previous risk. However, in our current social ecosystem, high-risk patients with alcohol related cirrhosis or smoking related COPD demand and get the same service as less risky patients at the same rates. This situation is unsustainable for any insurance company. There is only one way to make “insurance” for all comers regardless of risk happen in an ecosystem where all the players MUST be treated on demand. That’s to spread the liability out through the entire population net. Unless we’re prepared to deny service to those that refuse to pay (we’re not), everyone MUST participate, whether they want to or not. The fewer participants, the less likely the indemnification will stay viable. If we allow recalcitrant to refuse to pay for any reason, they will eventually show up and demand treatment on the backs of those that did. So we’re all going to have to pony up, like it or not. The alternative is a government and private insurance system that’s unsustainable, especially following the global financial crash of 2007. It isn’t “if” it will crash, it’s “when” and it will be soon at the rate they are increasing rates and denying service. As a practical matter, it doesn’t matter if it’s technically a tax or if it’s a tax by some other politically friendly name. It’s the price to pay for getting “most” Americans affordable health care coverage, deterring financial collapse for fault-less serendipity. The rest of the global medical village does it and we will too, or we will quickly price ourselves out of any ability to do so for any of us. Don’t care about your fellow citizens’ potential for financial collapse if they get sick? Refuse to pay increased taxes for people you care nothing about? That’s a separate issue and a separate argument. It remains to be seen whether you will be allowed to do that in our society. Don’t have to pay auto insurance if you don’t want to drive a car? Good. Ride a bicycle ten miles one way to work and watch your wife push a cart to the grocery store for a while and see how that works for you. Concerned that the sky is falling and any addition to the National Debt will collapse society? To that I say, how many guaranteed current disasters are you willing to ignore for a future that may or may not occur? The IDENTICAL arguments currently being used against the ACA were used in 1965 against Medicare/Medicaid, which turned out to be a great benefit to Americans and now an authentic sacred cow. The ACA isn’t perfect by a long shot, and there is no guarantee it will solve most of our current problems, but it’s a start solving some of them. In time, both consumers and providers will get used to the ACA, just like they did Medicare/Medicaid. It’s a proactive move to try to do something positive. Not relying on our current system, the continued escalation of which is increasingly ineffective and inadequate, accomplishing nothing but endless spending into a black hole. The risks and values of the ACA cannot be evaluated in an isolated snapshot. It’s basically a comparison issue. It’s value must be looked at compared to something. The alternative is doing nothing but allowing our current situation’s death spiral to tighten. The ACA is a risk, but it’s a reasonable calculated risk. We have to take that risk and make the best of it because the alternative is an inevitable, guaranteed disaster. 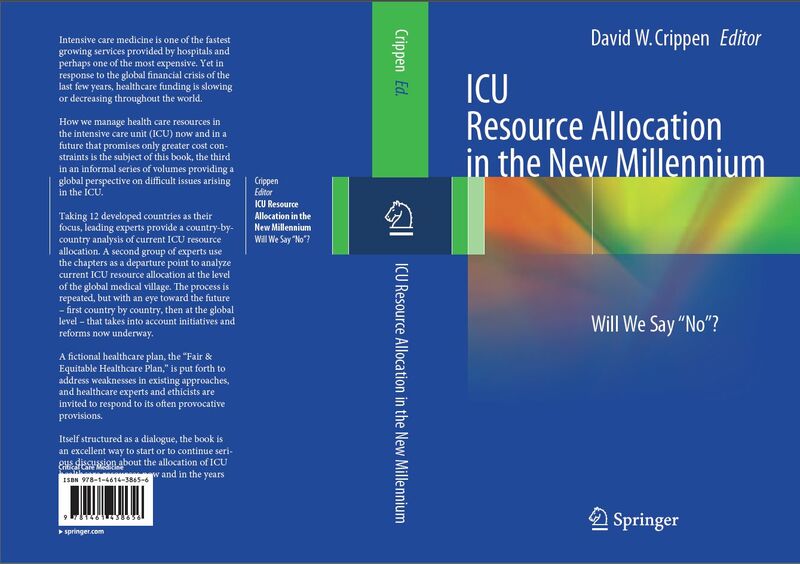 Further discussion in a multi-national forum will be out probably this September (see enclosed book cover).